STAN Wawrinka has fulfilled Roger Federer’s prophecy, destroying Novak Djokovic’s French Open dreams with a stunning performance. Proving victory in last season’s Australian Open was anything but a fluke, Wawrinka overpowered tentative Djokovic 4-6 6-4 6-3 6-4 to claim his second major. The Swiss all-courter is the first man in history to secure his first two majors against the world’s top-ranked player — Rafael Nadal in Melbourne and Djokovic in Paris. Condemning Djokovic to his third straight Roland Garros final defeat — and eighth denial from 16 grand slam finals — Wawrinka was magnificent. “I played the match of my life,” he said with pride — and not a hint of understatement. Selected by compatriot Roger Federer and Swedish former world No 1 Mats Wilander as the player most likely to terminate Djokovic’s unbeaten 27-match streak, Wawrinka delivered. And he settled, once and for all, the nonsense that he got lucky at the 2014 Australian Open, where he downed injured Nadal in the final after earlier receiving a walkover and retirement. As the sport’s premier frontrunner, Djokovic had never lost a major decider after winning the first set. Yet he was simply overwhelmed by the weight of Wawrinka’s groundstrokes as the match wore on. Wawrinka’s attacking instincts were reflected in 60 winners to Djokovic’s 30. The first Swiss to prevail in Paris after Federer in 2009, 30-year-old Wawrinka is the oldest man to win the French since Ecuador’s Andres Gomez in 1990. And he is only the sixth player after Ken Rosewall, Roy Emerson, Andres Gimeno, Wilander and Ivan Lendl to land the boy’s title (2003) before taking out the men’s. Wawrinka was beaten in the first round last year in a defeat that astonished Federer. Featuring in the first French final in 11 years not to involve either Nadal or Federer, Wawrinka played to win; Djokovic not to lose. 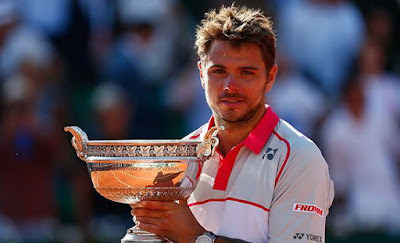 In the end, “Stanimal” proved correct grand slam record-holder Federer’s contention that the French Open was Wawrinka’s best chance of success. Yet in 10 previous attempts, the swashbuckling strokemaker had never survived the quarter-finals. The hiring of Sweden’s former world No 2 and 2000 French finalist Magnus Norman led to the transformation of an unfulfilled talent. The combative tone was set in the opening game when the pair shared the tournament’s longest rally — 39 shots. Wawrinka practically gifted the first set to Djokovic when he committed three unforced errors before a double fault to trail 3-4. Djokovic faltered when serving for the set, narrowly surviving a break point before sealing the set in 43 minutes. He turned to his wife Jelena, parents Srdan and Dijana and coach Boris Becker, shook his fist and roared in elation. It was then Wawrinka’s turn to feel the heat as he lapsed to 0-40, only to serve his way out of trouble. Something had to give — and it was Djokovic — as Wawrinka barrelled a backhand winner down the line to earn the right to serve for the championship. As wide-eyed Djokovic slumped into chair, Wawrinka allowed himself a wry smile. Aptly, Wawrinka completed an extraordinary coup on his second match point with a signature backhand down the line winner. He earned $2.6 million for the triumph.